The Intelsat II series of satellites, first launched in 1966, marked the third generation of communications satellites developed by Hughes. At the time they were the largest satellites ever launched into synchronous orbit for commercial operation. They were built for the International Telecommunications Satellite Organization (INTELSAT) under the direction of the Communications Satellite Corporation (COMSAT), which acts as manager for INTELSAT in the operation and control of the satellites. Earlier Hughes satellites included Syncom, which was built for the National Aeronautics and Space Administration [NASA], and Early Bird, the world's first commercial synchronous orbit satellite, launched by COMSAT in 1965. Since then four Intelsat II satellites have been launched. The first satellite, F-1, was launched 26 October 1966, for emplacement above the Pacific but failed to achieve synchronous orbit when the apogee engine thrust terminated approximately 4 seconds after ignition. Normal burning time would have been 16 seconds. The satellite, despite its nonsynchronous orbit, was used to transmit live television and other communications traffic. Intelsat II F-2 was launched 11 January 1967, into synchronous orbit above the Pacific near the International Date Line. Regular 24 hour commercial service via the satellite began 27 January 1967. The operation linked earth stations in the United States, Hawaii, Australia, and Japan. 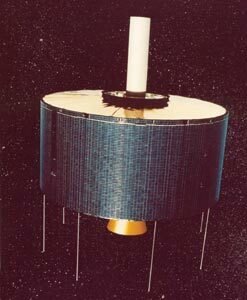 Intelsat II F-3 was launched 22 March 1967, and positioned in synchronous orbit above the Atlantic. The fourth satellite in the series, Intelsat II F-4, was launched September 27, 1967, for commercial operation over the Pacific. The Intelsat II satellites, in addition to commercial operation, provided communications support services for NASA's manned lunar landing program. The three satellites of the series, in continuous service throughout their 3 year design lifetime, are now retired. The Intelsat II's, twice as large as Early Bird and with more than twice the power, were equipped with an advanced antenna design developed by Hughes that permitted direct contact with a number of ground stations simultaneously. The design concept of the satellite followed the same basic principles developed by Hughes for Early Bird. These included spin stabilization, a toroidal antenna beam that continually encompassed the earth, and a simple gas jet system for attitude control and stationkeeping. The spacecraft structure consisted basically of a central stiffened tube directly supporting the apogee motor and communications antenna. An aft radial bulkhead and rib assembly supported the majority of the payload electronics. A forward bulkhead supported lateral and radial loads imposed by the apogee engine. Both ends of the structure were closed by thermal shields, the shield at the antenna end serving a dual role as an antenna ground plane. The basic communications system was composed of two redundant linear repeaters with 125 MHz bandwidth and 6 dB noise figure and four 6 Watt traveling wave tubes, of which one, two, or three could be turned on in parallel. The satellite's telemetry subsystem was similar to that of Early Bird and comprised two encoders, two VHF transmitters, and eight whip antennas. The encoders modulated both VHF transmitters and the 4 GHz beacon signals. Both VHF transmitters could be commanded on and off. The beacon signals were transmitted continuously and modulated with telemetry signals. Communications capacity of each satellite was 240 two-way telephone circuits or one two-way TV channel. The outer surface of the satellite was covered with 12,756 n/p silicon solar cells. These delivered 85 Watts of electrical power under normal operating conditions. A self-contained apogee motor, fired by command from ground control, supplied the velocity boost required to inject the satellite into synchronous orbit from the transfer orbit. Launch vehicle for the satellite was the Delta-E1.